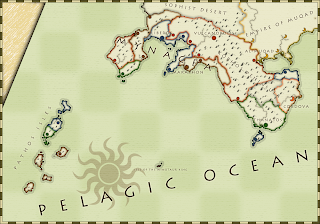 Famed for its philosophers, its galleys, and its theatres, Mynacea is a rugged and mountainous realm of squabbling city-states. The region was long oppressed by the grip of the dark Taurian Empire, whose enormous, labyrinthine ruins speckle the land, but now the Mynaceans rule themselves, bowing to no kings and no emperors. Since the overthrow of the minotaur king, they have built great cities like Vulcanopolis, Liberos, and Maraphon, wonderous temples and oracles, and spread colonies across half a continent. 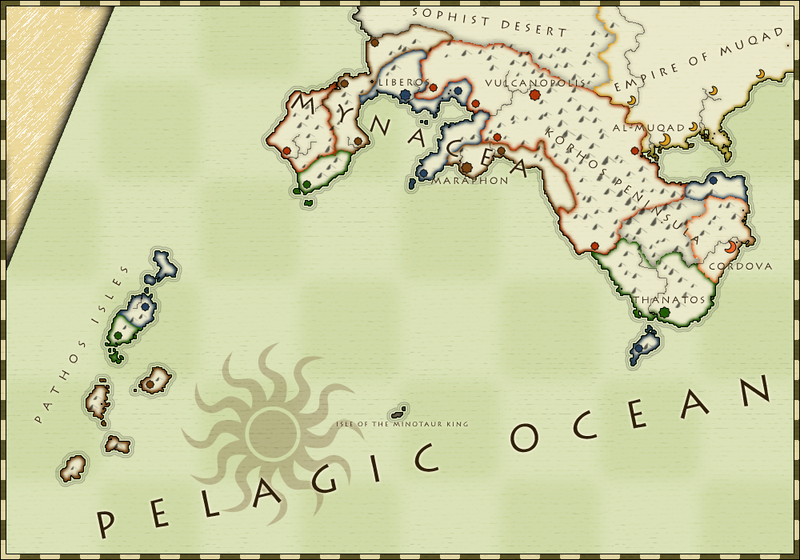 For mercenaries and adventurers alike, Mynacea is an land of opportunity. Little love is lost between the city-states, who compete in nearly every respect, from trade to colonies to sorcery. There is a constant threat of piracy, raiding, or even petty but brutal wars. And with the monsterous remnants of the Taurian Empire lurking in dark labyrinths, or the craggy badlands of the Korhos, it is a fertile land for monster hunters. Yet it is also a land of great wealth and achievement. Philosophers and inventors thrive on the patronage of the city-states. Thanks to a relative lack of taxation and tariffs, merchants thrive on the Mynacean trade routes, bringing amphoras of olive oil and wine to distant markets, returning with hulls laden down by gold and grain.